Outfit | Casual in Copenhagen + New Layout! First of all; I changed my layout! It’s not entirely different, but I freshened it up a little. The background color is lighter, and the dots also have a lighter and more pink-ish color. The color of the header, the titles and the edges of the boxes, is also a bit more fresh. And I changed the picture in the upper right corner. I did still like the previous one, but I hardly ever wear my hair up, so I thought it would be nice to add a photo which resembles my daily style more. Also, I changed the social media icons, and the font of the menu. Actually, I would like my menu with home, about and contact to be above my header in one of those nice thin bars, and then change the current menu into a menu with all the topics on my blog. But I wasn’t quite sure how to do that, so for now, I’m really happy with it! What do you think of this new look? I hope you like it! And now off to the outfit; this is my last outfit from my trip to Copenhagen. That day, we went to Castle Island, and we bumped into this cute little spot, which was also very quiet. Ideal for taking outfit pictures! Because it was a bit colder that day, I was wearing a more warm and casual outfit. I think this is probably one of the more casual outfits I’ve ever shared on here. But I think it’s fun to show that too! Personally, I really like the combo, and I’ve actually been wearing it more often lately. But then, I like to add my black satchel bag with white polka dots, just to give it a little extra. But I didn’t take that bag with me to Copenhagen. Also, with my coat over it, I really like the sleeves sticking out a bit. So, what do you think of this combo? Je layout ziet er mooi uit! En de look vind ik prachtig <3! Leuke outfit maar ook weer met lipstick en nagellak, ziet er altijd zo verzorgd uit! 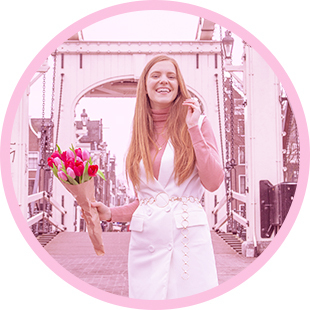 Door jou blog te volgen, krijg ik ook meer inspiratie om meer bezig te zijn met sieraden, make-up enz. Dus ja ik blijf je volgen! Wat een leuke outfit vind die broek echt heel erg leuk! the red pant looks amazing on you.